For the first time, primitive human kidneys have been created in a laboratory dish, by using stem cells. Although the kidneys cannot perform the functions of a fully formed adult kidney, the researchers hope the achievement will someday lead to new ways to treat people suffering from kidney failure. "It&apos;s really exciting," says Melissa Little, who heads the Kidney Research Laboratory at the Murdoch Children&apos;s Research Institute in Australia. She led the research, which was published Wednesday in the journal Nature. "I think this is a really big advance." Kidneys are essential for life. They perform a host of crucial bodily functions, including filtering toxins from the blood and regulating blood pressure and bone density. But kidneys can fail for a variety of reasons, including poisonings, infections and other diseases. "The problem is that if something goes wrong with your kidneys there are only two options and these have been the same for 50 years: You either have a transplant or go onto dialysis," Little says. "So we really need alternative options." To find alternatives, Little and others have been trying for years to grow kidneys in the lab using cells known as induced pluripotent stem (iPS) cells. "Almost 10 years ago now it was shown that you could take any cell from anybody — like you or me — and actually convince it to go back into the state that&apos;s essentially like the fertilized egg. So it is able to turn into any tissue type," Little says. While scientists have been able to use iPS cells to create many types of human cells, using them to create a kidney has proved difficult. The problem has been finding just the right combination of chemical signals to trigger iPS cells into making the various tissues in a kidney. "It&apos;s like a recipe," Little says. "We put different concentrations and types of growth factors in a certain order into the dish. And then when it gets to a certain size we take all the cells and make it into a ball." After that, the cells talk to each other, she says. One type of cell will signal to its neighbor, and its neighbor will signal back and that actually makes them form the appropriate shape. They were able to create some – but not all — of the key structures of a kidney, including nephrons, which are involved in filtering toxins from the blood and producing urine. "It&apos;s an incredible process," she says. 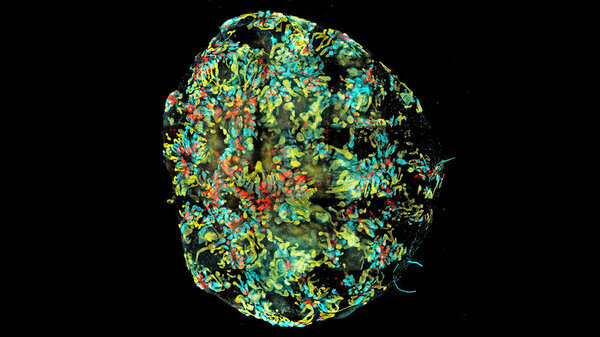 In the new study, Little and her colleagues report they finally found the right recipe to create kidney "organoids" — very small, primitive kidneys that are more like the kidney in a fetus. They are only able to do some of the functions that a kidney performs, such as filtering toxins from blood, Little says. The organoid is not advanced enough to do all the very complicated balancing that a completely formed kidney does. Little&apos;s group is hoping the organoids may eventually continue developing into more fully functioning kidneys. In the meantime, the primitive organs could possibly be used to help save failing kidneys by transplanting parts of them into patients, she says. Whether that will work remains to be seen. Another use may be in pharmaceutical research. Companies could use the tissues to test new drugs. "The pharmaceutical industry is really interested in having organoids made from human cells that will be good proxies for human kidneys so they can do their safety testing on those," says Jamie Davies, a professor of experimental anatomy at the University of Endiburgh who was not involved in the research. He wrote a commentary that accompanies the paper in Nature. "The really long-term application and the thing we&apos;re all trying to do is to produce from a patient&apos;s own cells to produce new kidneys for them," he says. "This is taking quite a big step forward," Davies says, toward that goal.